Twitter liars are lying about the size of Beto's crowd. It was very small compared to the numbers Trump drew. Beto is a joke propped up by the MSM. That's all he is. The Hill reports President Trump on Monday boasted that his El Paso campaign rally drew far more people than the one former Rep. Beto O-Rourke (D-Texas) headlined across town, claiming that he had more than "35,000 people" attending. “A young man who's got very little going for himself except he's got a great first name. He challenged us. 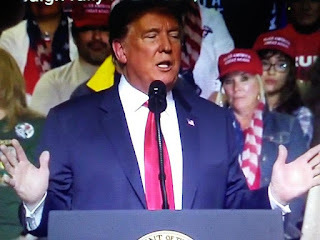 We have say 35,000 people tonight, and he has, say, 200 people, 300 people," Trump said while speaking at at a campaign rally in El Paso. "Not too good. In fact what I would do, that may be the end of his presidential bid."